← Did You Know that Red Heart’s Website is Bilingual? Let me tell you a few tips! Every day, we are asked to Google or use YouTube to find content for our fans. It’s a never ending question. Most questions would not exist if the knowledge of search engines and how to use different platforms were embedded in our brains. To help our fans locate content quicker instead of asking us to do the searches to find specific videos on YouTube. 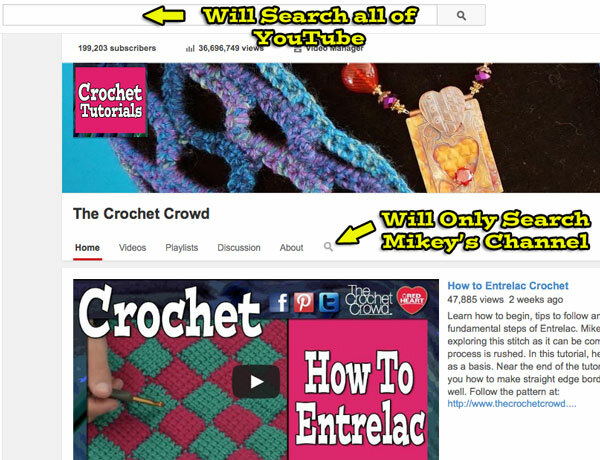 Let me show you how easy it is to search on The Crochet Crowd YouTube Channel. Which Search Box to Use? There are two search boxes on YouTube. Each search box will produce two completely different results. The top search box that is on the top of the page will search the entire world of YouTube. In the grand scheme of the search engines, I can be found easily but it doesn’t separate my videos from the rest of the people. 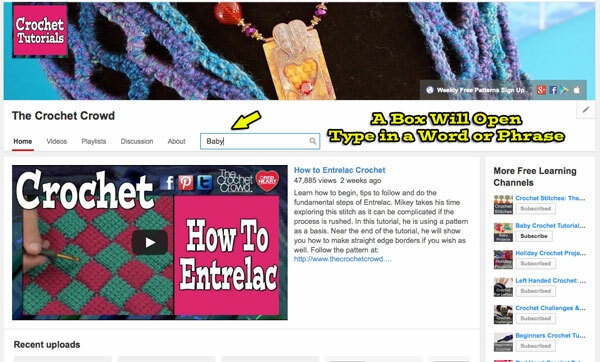 The search box under The Crochet Crowd cover picture will produce results that are only showing my videos. What are you looking for? There are two search boxes which change your search engine results. There is a magnifying glass under the cover photo of the channel. To access the search box, simply click it and it will open up a new box. Click the magnifying glass to access the search box. Inside the search box, you can type in words or phrases pertaining to what you are looking for. I have been specific in details about the videos for this search engine to be effect. For example, if you entered in the word baby into the box… it will produce results for Baby. The key is to be general but also you can narrow down the results easily. If you are looking for a baby afghan. 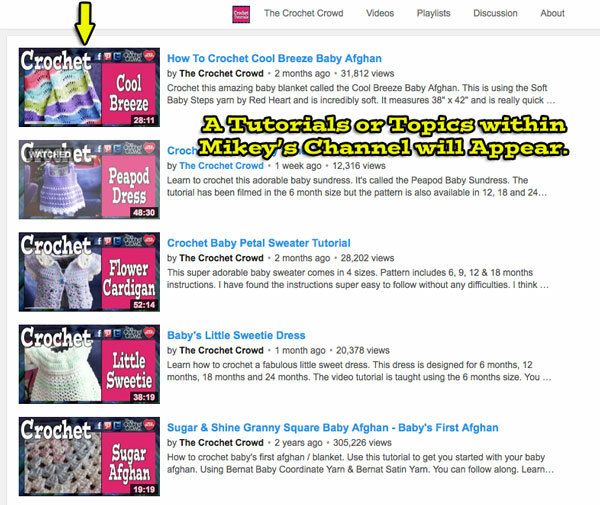 You can type in baby afghan blanket and tutorials will pop up. Use Keywords or phrases to locate content. When I clicked enter after using the word baby. The results come back. Your YouTube will know if you have seen a video before as it will indicate that it’s been ‘Watched’. This helps you narrow down videos that you might have seen, made a judgement call to come back. How to use YouTube Search Engines… Results are up to your keywords. Playlists are like creating your own ‘mixed tape’ where you are gathering videos you like into one playlist. You can create as many playlists as you need. These playlists can be seen in your very own YouTube Channel. We have our very own Playlists too! 100’s of thousands of people have their very own playlists. They collect videos into a playlist that is easy to find and access at a later time. You can create playlists that are very specific to your interest. Maybe you want a playlist of all my videos of just of Baby Afghans. You can do that. The cool thing is that people will find your Playlists on YouTube. 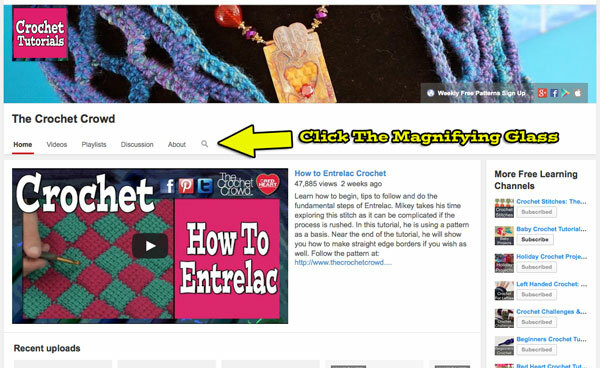 If crocheters love your taste of playlist collections, you most likely will be subscribed to as you become a ‘trusted’ individual that knows great content when you see it. You can select my videos but you can also select other tutorial hosts or any video on YouTube for that matter for your collections. It’s a really convenient feature. To understand more about Playlists and creating your own, you can watch the tutorial below. Derral is certified by YouTube to offer you advice and a helping hand. Did you find my info helpful? Leave me a comment below with your thoughts? I love hearing from our fans. This entry was posted in Advice & Tips, Social Media Tips. Bookmark the permalink. Thank you for this information. I don’t play a lot of videos (limited bandwidth on my wireless connection) but I do sometimes have trouble finding things – it just seems that as the internet grows my search abilities – which have always been pretty good – are falling behind. I haven’t tried to create any playlists – I assume that needs a login and I never do that – but just knowing where to search for specific videos on a channel is really helpful. I think there used to be a separate box for that and when it disappeared I was really stuck. I’m happy to discover that’s what the magnifying glass is for. Excellent information! Now if everyone will just read it! LOL! I especially liked that you included the info on playlists. Thanks!